We can scale your cats teeth to remove tartar during their annual health check. This helps to promote oral health by reducing the risk of developing gingivitis and periodontal disease, which can be irreversible. Pictured above is Mike hand scaling his own cat's teeth. By placing the pegs on his neck he can be restrained and becomes quite relaxed, permitting Mike to clean his teeth as a dentist would. This technique eliminates the need for a general anaesthetic which reduces stress and risk for the cat as well as the cost for the owner. Some cats are prone to tartar build-up, and require their teeth to be scaled twice yearly. We can also provide Hills Prescription Diet T/D biscuits, which when eaten work to reduce plaque and tartar build up between visits. 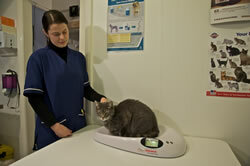 For overweight and obese pets we offer a weight loss and management programme providing you with advice, support and low-calorie foods to help ensure a healthy animal. 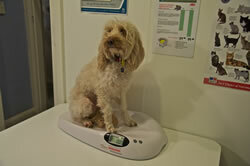 In addition to this it is free to weigh your pet at the clinic to monitor their progress. To have other pets desexed, please call us for more information. Then annual vaccination boosters are required. Vaccinations are required annually. If they have never been vaccinated, or are not up to date a booster vaccination is required 3-4 weeks after the initial vaccination. Annual vaccinations can be resumed after this. We recommend that all cats and dogs are microchipped, all it takes is a 15 minute appointment during which a small, rice-grain sized device is injected under the skin between your pets' shoulder blades. Having your beloved pet microchipped can help protect both you and your pet from the stress of them being lost or stolen, enabling them to be quickly and easily identified and returned to you, no matter how far from home they end up. We are able to arrange and assist with the import and export of animals between New Zealand and Australia, as well as with domestic travel. If you require assistance with travel further afield, or have any queries please contact us as we may be able to help.